Serenes Forest Scribbles: Voting Now Open! We’re pleased to announce that Serenes Forest Scribbles 2016 has entered the final and very exciting phase: the voting phase! 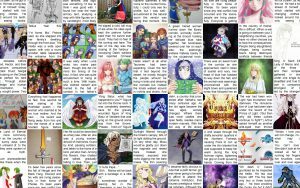 From late 2016, we’ve been encouraging talented members of the Fire Emblem community to share their best creative works, whether they’re drawings, writings, crafts or anything that can be considered art. Now is the time for fans to vote for their favourite pieces, so we can dish out prizes for the top-ranking entries! If you haven’t yet seen the entries, we’ve gathered them all in one place, in our prestigious Hall of Fame. Voting closes on 15th April 2017, which is in a week’s time. Rules for voting can be found within the respective categories. Note: A forum account is required to vote, but creation is free and easy!